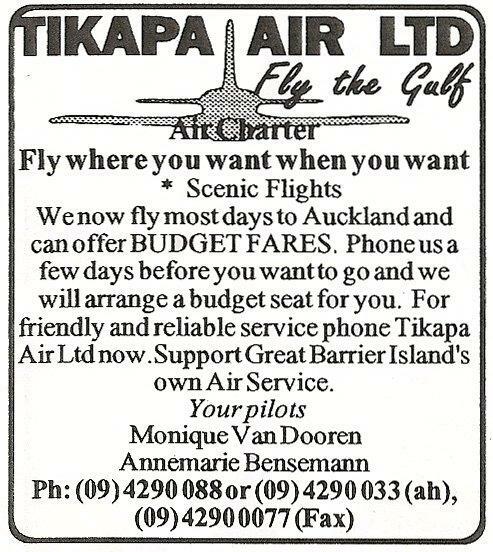 Tikapa Air, Great Barrier Island’s only locally owned airline, was established by 21 year old Great Barrier resident Monique Van Dooren in 1992. Originally the company was going to be called Sky Venture, connecting it to Monique’s parents’ enterprise Aquaventure Scuba Diving. Instead, at the suggestion of an elderly Maori woman from Katherine Bay. 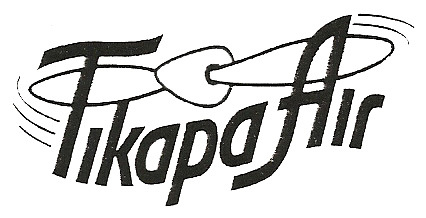 the airline was named Tikapa Air after Tikapa Moana the Maori name for the Hauraki Gulf. Monique had her taste for flying when her mother arranged a trial flight for her. 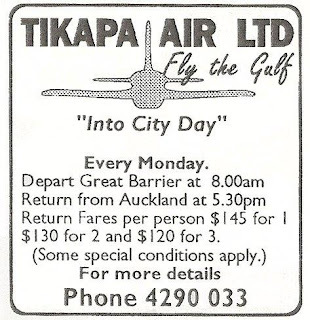 Thoughts of going teaching were put aside in favour of a career in aviation and, in January 1992, equipped with a commercial pilot’s licence and Cessna 177B Cardinal ZK-DAN (c/n 17701528) Tikapa Air began operating offering air charter and flightseeing services from Claris airfield. 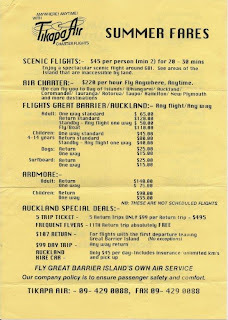 A Monday Great Barrier Island to Auckland return service was also offered in the first few months. This service, which went over in the morning and returned in the late afternoon allowed islanders a whole day for business or shopping in the city. An office was established at Claris airfield in April 1992 and this lifted the company’s profile. 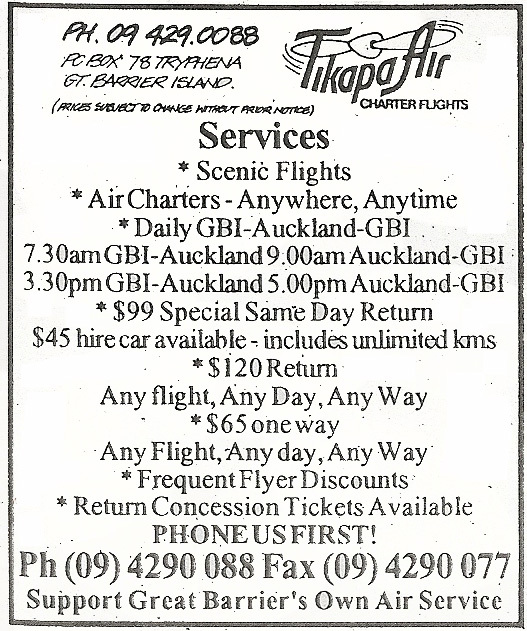 By mid-1993 Tikapa Air was flying an on demand service to Auckland most days and in November 1994 a regular service was established in competition with Great Barrier Airlines. Summer 1994/95 saw the hire of Piper Pa32-300 Cherokee Six, ZK-WGO (c/n 32--7340146) to meet the growth in traffic. 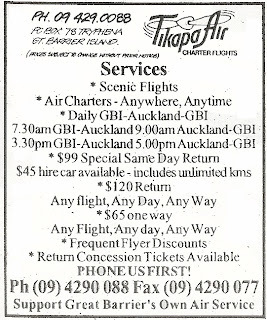 Tikapa Air's Cessna 177 Cardinal ZK-DAN boarding for Great Barrier Island at Auckland on 7 September 1995. Some years before its use on the Barrier run, Cardinal ZK-DAN at Timaru on 25 March 1987. 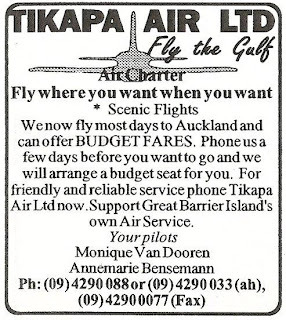 By 1995 Tikapa Air had become bigger than Monique had ever anticipated with two daily return flights being offered. While, for most of the year she worked alone, she recognised that, for the best interests of the local community and the future of the Island, the operation needed a major expansion and a larger aircraft. 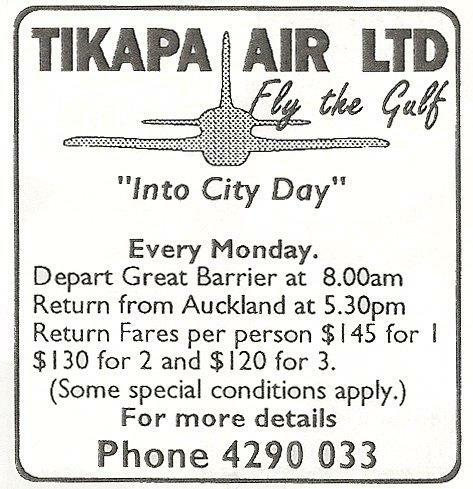 At this time Air National had, over a period of months, taken a keen interest in Tikapa Air. They were impressed with what Monique was doing and how she was doing it. 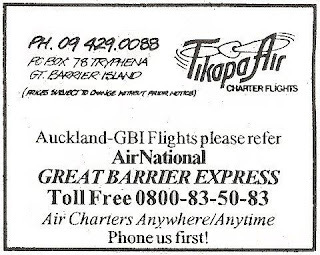 As their GAF Nomad wasn’t doing much Air National suggested they could work together with Tikapa Air. Monique was interested. Her airline was well established and at the time she could see the advantages of it being a mutually beneficial arrangement. 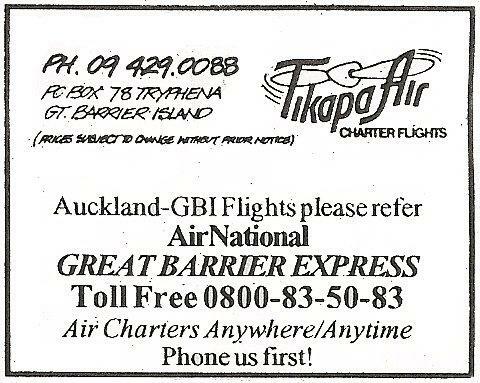 As a result, Air National and Tikapa Air merged together to launch Great Barrier Express. Monique, along with Air National, managed the project and integration of the service. A ‘hand over’ wine and cheese evening was organised on Great Barrier Island at the Claris Club for residents and local businesses and the merger was introduced and explained. 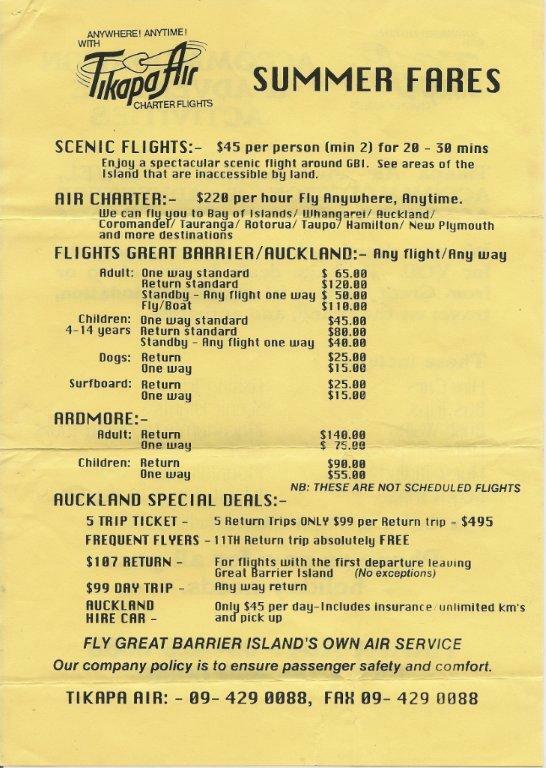 Great Barrier Express was launched on the Auckland–Great Barrier Island route on the 6th of October 1995 using GAF N24 Nomad ZK-ECN with Monique joining Air National as a Nomad pilot whereupon Tikapa Air ceased to operate and the Cessna 177 Cardinal, was sold. Piper Cherokee 6 ZK-WGO was used by Tikapa Air during the summer of 1994/95. It is seen here being used by Glenorchy Air at Milford Sound on 14 September 1997.